Bodies of Water by artist Carolina Caycedo. Abstract: This essay presents the work of Más Arte Más Acción, a UK–Colombian non-profit cultural foundation set up in 2009 by visual artist Fernando Arias and cultural manager Jonathan Colin. Its mission is to generate interdisciplinary projects by working with artists and other professionals to explore two cultural and developmental poles that are shifting apart, one urban, the other rural, in humanity’s ongoing disconnection from nature. The essay explores global social and environmental issues, and, in particular, details the lives and challenges of people living near the foundation’s base in the remote Colombian rain forest of Chocó. Humanity’s disconnection from the rest of nature lies at the heart of Más Arte Más Acción’s work, a UK–Colombian non-profit cultural foundation set up in 2009 by visual artist Fernando Arias and cultural manager Jonathan Colin. The foundation generates interdisciplinary projects by working with artists and other professionals to explore two poles that are shifting apart; one urban, the other rural. The former increasingly organises, controls, and owns the latter. These poles have the potential to learn from each other and cooperate in order to shape the future of the planet. Humanity’s disconnection from the rest of nature lies at the heart of Más Arte Más Acción’s work…as such, the foundation focuses the lens on today’s global challenges, including biodiversity loss, food production, urbanisation, and consumption. Through Más Arte Más Acción’s cultural programme, social and environmental issues are explored, often involving people living near the foundation’s base in the remote Colombian rain forest of Chocó (separated from the Amazon basin after the emergence of the Andean range a few million years ago). As such, the foundation focuses the lens on today’s global challenges, including biodiversity loss, food production, urbanisation, and consumption. The phrase nowhere better than this place has given structure to the foundation’s five-year Nuevatopias/new-utopias programme (2012–2016). The phrase relates to utopia as well as Chocó. Nowhere Better Than This Place / Somewhere Better Than This Place (1989–1990) is an artwork by Cuban-born artist Felix Gonzalez Torres. The foundation appropriated the phrase as the antithesis of utopian thought, and for five years added a word to the title of its annual publication in order to build the phrase; that is, the first publication was entitled Nowhere, the second Better Than, and so on (see the publications section of the foundation’s website).In 2016, the phrase was revealed to reinforce the idea that humanity has to live within Earth’s finite resources. Thomas More created the word utopia in 1516 as the name of an imaginary island, with a more just society than existed at that time. More referred to his island of Utopia as "Nowhere," and since the name derives from the Latin u, meaning "no," and topia, meaning "place," the chances of finding or establishing it were low from the outset. Many would argue that attempting to make it a reality is, however, a worthy ambition. The world has changed much in the past 500 years since More’s Utopia, from the colonisation of the Americas, to industrialisation, urbanisation, and the expansion of capitalism to the four corners of the globe; we have experienced real revolutions in communication, agriculture, and health; and scientific advances have transformed the understanding of nature and evolutionary processes, to name but a few. During this period, the human population has multiplied more than 15 times—from around 450 million to 7 billion plus; measured in geological time, these changes have occurred in an instant. Whilst utopianism has been blamed for failed ideologies, from Nazism to Communism in the 20th century, imagining how life in the present can be improved appears to have formed part of the human condition in most cultures since the earliest writings. Más Arte Más Acción decided to mark the 500th anniversary of More’s Utopia in a series of projects, called Nuevatopias, by inviting creative thinkers, writers, and artists to reflect on utopia and the poles of metropolitan structure and natural growth between which it is oscillating. 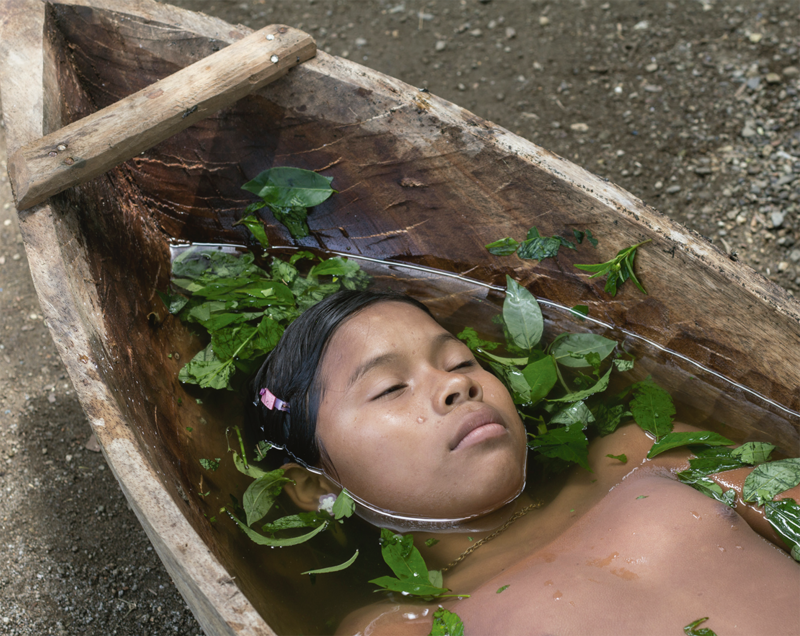 When Fernando Arias and Jonathan Colin first visited Colombia’s remote Pacific region, called Chocó, some 18 years ago in order to photograph and write about it for a small travel magazine, that visit changed their lives. They returned each year to the village of Coquí, staying with Fausto Moreno, a friend they made during that first trip. 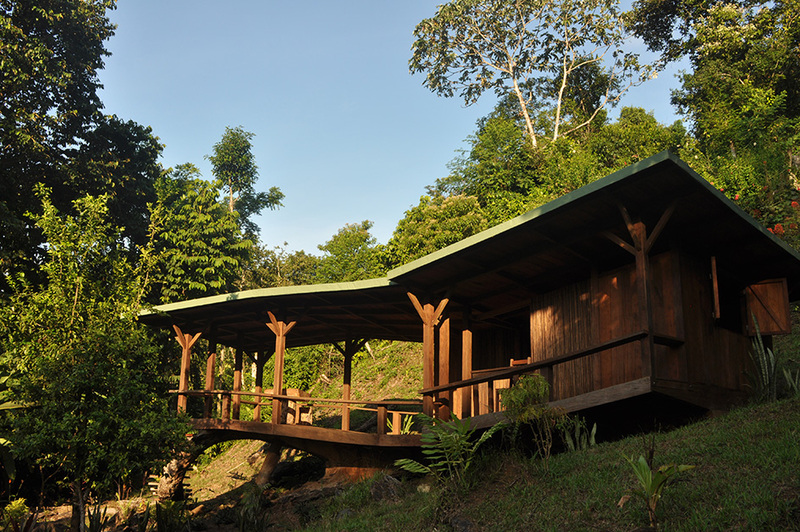 In 2002, they bought a wooden cabin near the hamlet of Guachalito, where the dense rain forest meets the open Pacific. Fernando made a film there about a young woman who dreamed of becoming a dancer. Displaced by violence from her home near Nuquí, the 17-year-old’s story and her brutal murder some two years later was a foreboding tale of poverty, violence, hope, and despair. He went on to document other people’s lives in Chocó, focusing on the empty spaces where nothing remarkable happens; silences that speak volumes about the human condition. Tatiana Washes the Plates and Violín explore these seemingly empty spaces, rearranged to give perspective to their reality. The small wooden cabin purchased by Fernando Arias and Jonathan Colin in 2002. Chocó’s coastal communities have little to do with the rest of Colombia. Caught between the ocean and rain forest, many proudly declare their nationality as "Chocoano." Across the rest of the country, most have turned their backs on this economically poor region, its people and beaches black, its forests dark, dangerous, and impenetrable; with prejudice and ignorance, they label it inservible. National and international companies circle like vultures over Chocó’s gold, platinum, silver, its rare-earth metals, minerals, and trees—an abundance of resources to be exploited. Inside the forest, indigenous people claim their rivers are polluted by mercury used for gold extraction. A young Embera, Ariel, tells us that fish are scarce in the river that sustained his community for generations, and he is now displaced, living on the coast in order to fish from the sea. But the sea is franchised to trawling companies from far away, scraping the seabed for 8 months each year to send their catch of prawns to Europe; the remaining dying sea life is thrown overboard for albatross and pelicans, whilst local fishermen in their dugout canoes catch less and less each year. Fernando articulately documents this process in his video Enjoy your Meal, placing together the pieces of this simple jigsaw that is devastating traditional fishing practices and lives. Globalisation’s tentacles observe no borders and, as a result, the poles shift further apart. Did the company directors and online investors in Asia, Europe, Canada, and the United States, who trade these "commodities," grow up searching for their food, gaining knowledge of life’s cycles and its limits in the process? In 2006, Jonathan and Fernando moved to the cabin with no electricity, phone, or Internet service. Instead, they had time to grow food and observe nature. With support from the Prince Claus Fund in the Netherlands, they organised activities in Nuquí, such as helping to set up a cultural centre that year, called Casa ChocoLate. A few years later, they discussed the idea of bringing others to share this place that had marked them so profoundly. They imagined how it could work, including the benefits for everyone of sharing this extraordinary location. However, the weather is often extreme in Chocó; the wilderness also confronts outsiders unused to this environment. Nevertheless, they imagined building a shelter next to their cabin, a platform in the forest to invite others to think about the world’s shifting poles. The cabin’s attached shelter, built by Joep van Lieshout in 2011. Considering who might design such a shelter—since it could also link with the other pole, so remote here in the rain forest—Fernando and Jonathan looked for an artist from the urban West. They were attracted to Joep van Lieshout (Atelier Van Lieshout) because of his challenging and sometimes dystopian work about the human condition. They were curious to see how he would react to this paradisiacal environment, from the point of view of his idiosyncratic mix of artistic and design practices. In the art world, Joep van Lieshout is known for his provocative work that deals with the absurdities and fundamental drives of the human species. In the late 1990s, he built a free state in Rotterdam, with its own laws (until the government shut it down), and he also designed a floating abortion clinic to bypass nations that outlawed the practice. Later, he became known for his dark sculptures that spelled the end of human existence. They thought about inviting Van Lieshout for more than a year and finally asked him to come to Chocó to design the shelter. He arrived in February 2011 and stayed for a month. Van Lieshout’s dystopian visions melted once he reached this "primitive" world. The Art Industry became a distant land as he travelled by canoe deep inside the forest to meet indigenous people. As his contact with the West retreated, Van Lieshout produced a shelter that relied less on himself and more on his new surroundings. Against his initial instincts to seek confrontation, but still close to his usual production method, he opted to work with local materials, local knowledge, and local labour. The shelter’s origins began a century or so after Thomas More wrote Utopia when the seedling of a Jenené tree established itself on a hill by the sea in Chocó. Around 300 years passed by until a neighbour, Marciano’s grandfather, felled the giant Jenené tree to make a boat. 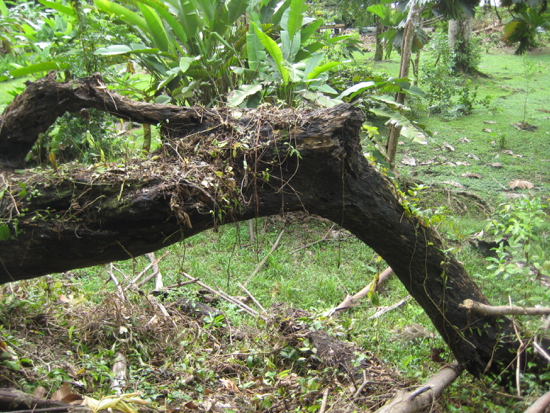 The massive remains of the tree had lain undisturbed inside the forest for more than half a century; its well-preserved wood proved too hard for termites to digest, its trunk unsoftened by rain and humidity. Van Lieshout was fascinated by the trunk with its robust curves, which came to dictate the shelter’s irregular form. Fercho (Fernando Malagón) was the only man living along the coast who had the skills and tools to construct the shelter to Van Lieshout’s specifications. Fortunately, a job had been cancelled so he had the time to work with Fernando and lead a small team of craftsmen for the six months it would take to build. The jenené tree trunk that served as inspiration for Joep van Lieshout’s shelter design. 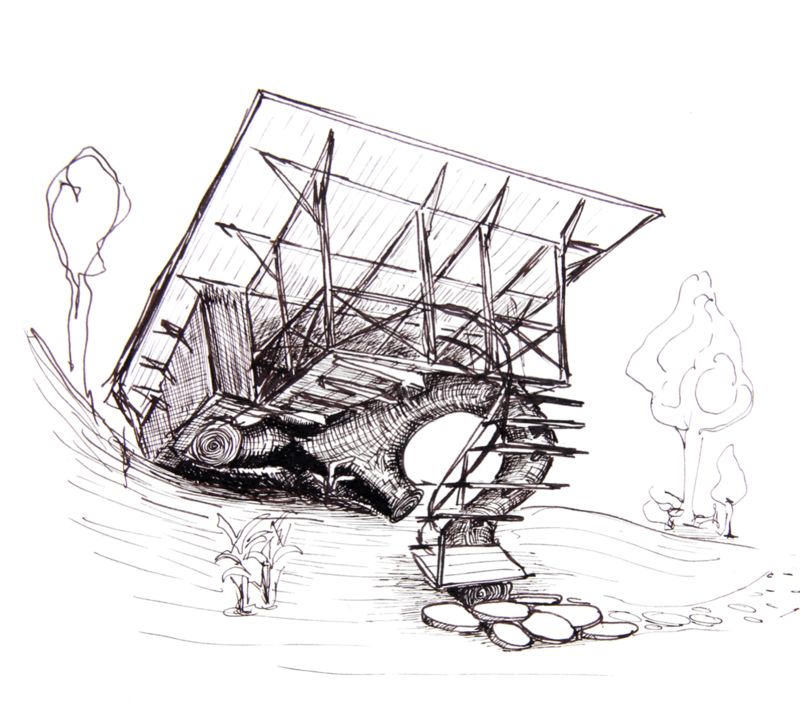 One of Joep van Lieshout’s drawings of the shelter. Van Lieshout left drawings and work instructions with Fercho. Torrential storms created the biggest challenge as part of the hill behind the trunk collapsed, submerging and almost destroying the half-constructed platform. But by March 2012, the asphalt roof was finished and the shelter was ready to receive guests. There was considerable discussion with neighbours about how the foundation’s base would function. The idea of exploring utopias and dystopias in the lead up to the 500th anniversary of More’s Utopia in 2016 emerged early on, and the foundation decided to invite people to Chocó each year from a range of practices to reflect on these concepts. They planned ways of involving people from other countries to exchange ideas through cultural programs. Fausto, now a community leader working with Más Arte Más Acción, thought it important to begin by considering food and its production. 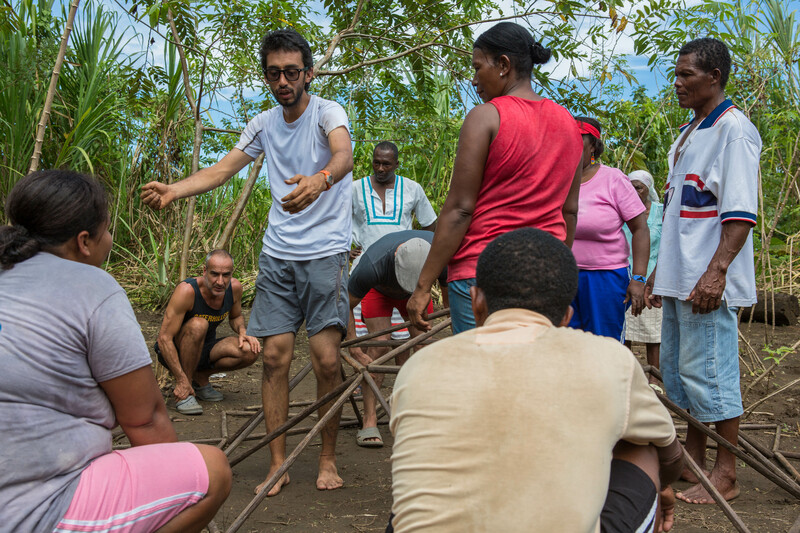 Fausto, a community leader working with Más Arte Más Acción. Community members and invited guests gather in 2012 to discuss food, health, and sustainability. Food, sustainability, and health became the focus of 2012. Invitations were sent to a mix of creative thinkers and practitioners, including Dr. Mabel Torres from Bioinnova at the University of Chocó, who came to talk with communities about planting techniques and sustainability. Along with her colleague, Yessika Serna, they inspired women, encouraging them to value their role in providing food, whilst demonstrating the impact they were all making internationally by advancing horticultural best practices. Coquí formed a group to create a community garden with two greenhouses in which they planted a variety of seeds. Along with nearby villages, they celebrated their gastronomical traditions at a festival in which the chef Leonor Espinosa came to share ideas and recipes. To bring both poles together, talks and events with universities and arts organisations in Cali, Medellín, and Bogotá were organised. Colombian artist and medical practitioner Libia Posada worked with older people in the communities, recovering knowledge of traditional medicines before producing leaflets explaining these health practices—in this region without medical facilities. Herbs of Salt and Soil by artist Libia Posada. 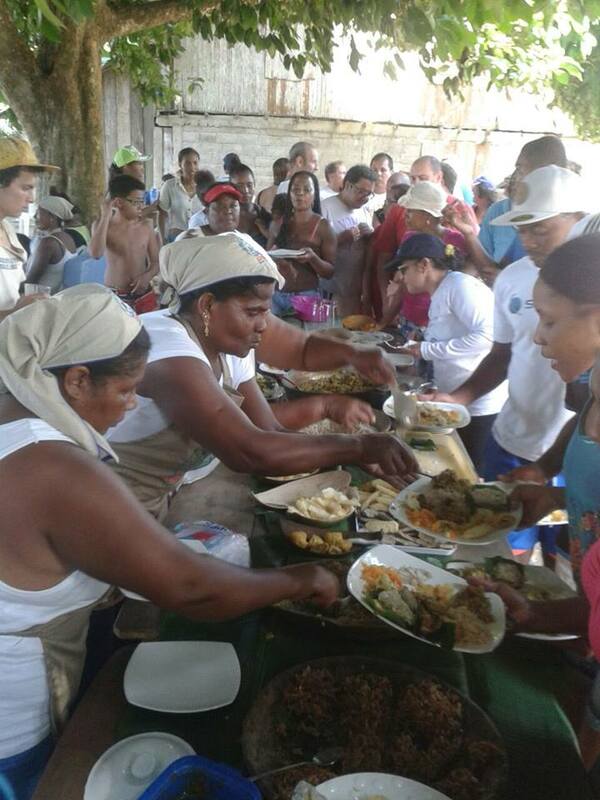 Posada was invited to participate in Más Arte Más Acción’s Nuevatopias program, to explore traditional medicine practices in communities near the Chocó Base. 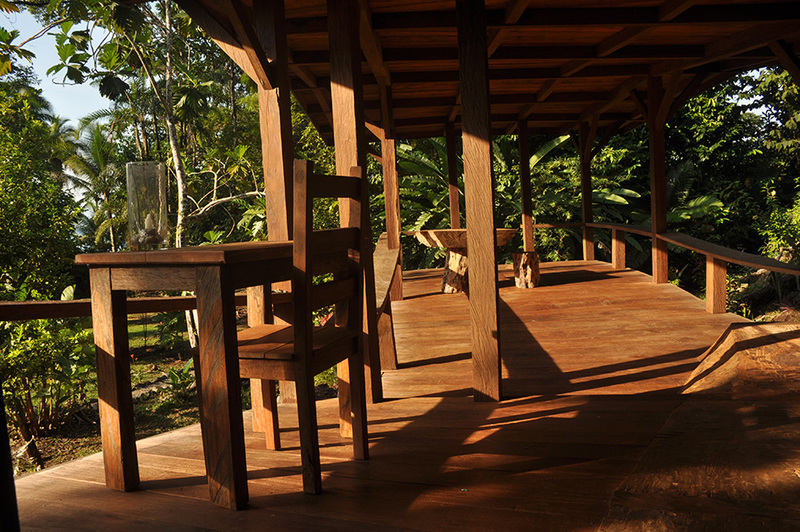 The Chocó base and its surroundings are eloquently described by several visitors, each taking shelter there and each with a particular interest in design and art, including Max Bruinsma, Justin McGuirk, and José Roca. Writer Alfredo Molano sets out the broader context of the region in his powerful essay, which includes a valuable testimony by a neighbour, Marciano Gonzalez. Contemporary artists Kan-si from Senegal and Antoinette Aurell and Rirkrit Tiravanija from Thailand exchanged ideas with neighbouring communities and had time to reflect on Nuevatopias. Their powerful contributions focus on the idea of place, culture, and utopia. Water and consumption are highly relevant issues in relation to the location of Más Arte Más Acción: the Chocó rain forest on Colombia’s remote Pacific coast. This is one of the planet’s most biodiverse regions, and such biodiversity depends, to a large extent, on the fact that it is also one of the world’s wettest tropical forests. Moreover, Chocó’s Pacific and Atlantic oceans and rivers are rich sources of food and provide transport for coastal and inland communities. At the same time, this fragile ecosystem is experiencing severe impacts from global consumption patterns, which characteristically play a significant role in greenhouse emissions, global warming, and rising sea levels. The foundation’s goal in 2013 and 2014 was to discuss the topics of water and consumption, and it is perhaps no coincidence that several artists and writers dealt with mining. Chocó’s communities are not only exposed to these global phenomena; on the ground, they bear direct consequences of the global demand for resources such as gold and rare metals used in modern electronics. Many of Chocó’s rivers are poisoned with mercury as a consequence of gold extraction, which has become a lucrative and less risky business for guerrillas and paramilitaries than drug trafficking once was. Lucas Ospina’s essay, "(Under)Mining the Mining Sector [Minando la Minería]" in Better Than about the documentary For All the Gold in Colombia explores this further. The overwhelming presence of large corporations, however, does not open up new opportunities for local inhabitants. In their short texts, local teenagers from Chocó, Osneyder Valoy and Klidier Josué González, describe the constant battle of their communities to find ways to make a living and be able to resist the allure of illegal economies. Today’s insatiable appetite for metals is directly linked to a growth economy that demands we permanently replace the technology we use for the next upgrade. And, due to planned obsolescence, each new model offers a diminishing improvement on the previous one. Devices are becoming increasingly transient: they end up in landfill within a few years. Our economic system requires perpetual growth, without which its wheels stop turning. To reduce the amount of goods we consume seems a logical response, given the damage we know we are causing to ourselves and to the planet. But without a radical change in the rules of the global economic system, we appear set on erasing the planet and humanity. In "The Impasses of Consumerism," Slavoj Žižek reminds us that we are all consumers, and Juan Fernando Herran’s photos in Medellin’s comunas (shanty towns) clearly reveal that even those living on the margins of the globalised economy are equally drawn into unstoppable consuming consumption. Today’s insatiable appetite for metals is directly linked to a growth economy that demands we permanently replace the technology we use for the next upgrade. The second in the series of Nuevatopias books, Better Than, also includes contributions from a wide range of participants, most of whom visited the foundation’s rain forest shelter in 2013 and 2014. Amongst them, artist Miguel Ángel Rojas confronts us with a shocking image that relates to the violence in Buenaventura, Colombia’s only Pacific coast port. Maria Fernanda Cardoso combines information, graphics, and photography to present facts about water and life. Through an extraordinary journey along the Rio Guapi, in one of Colombia’s conflict zones, Angolan artist Victor Gama and Colombian musicians Urian Sarmiento and Pedro Ojeda researched the connections between musical traditions of Angola in West Africa and Colombia. Philosopher Catalina Vargas Tovar, from Tropenbos International, explores ethnobotanist Abel Rodríguez’s views on water. Geologist Julio Fierro explains the long-term consequences of our intrusion into the depths of the earth to extract metals and fossil fuels. 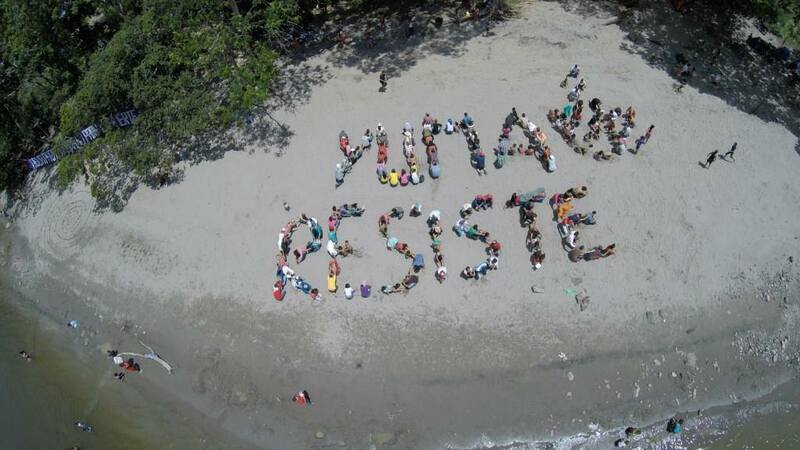 In the context of climate change and activism, Carolina Caycedo worked with communities along the Magdalena River who are affected by the "Master Plan for Exploitation of the Magdalena River." Caycedo developed a series of protest-based actions and interventions with people living along the course of the river where the government and private companies plan to build a number of megadams. Fernando Arias explores two contrasting perspectives on the Amazon region and the Sahara Desert in Cantos de Viaje (Chants of a Journey) and Jardines de Resistencia (Gardens of Resistance). The foundation’s Nuevatopias programme concludes in 2016, the 500th anniversary of Utopia, with reflections and critical analysis of Utopia by Colombian cultural critic Erna von der Walde. Through Minga, Exploring Utopia, we joined forces with 21 Arts Collaboratory partners from around the world to explore the concept of utopia in each organisation’s context. Launched at the São Paulo Biennial in November 2014 with a manifesto, Minga generated wide-ranging perspectives about the concept of utopia from around the world. For example, British artist Alison Turnbull explored the dark nights in the rain forest to reveal moths and other insects hidden during daytime. In Bogotá, Más Arte Más Debate joined the Kuir Festival to showcase queer art and cinema in order to explore the relationship between culture, identity, gender, and sexuality. In the Pacific port of Buenaventura, we coordinated Puerto Creativo in which audiovisual material was created by young people to tell their life stories. For Sinfonía Trópico, an initiative that raised awareness of biodiversity loss and deforestation and its impact on climate change, Fernando Arias directed the video Atrato. The work explores the relationship between humans and nature by focusing on the environmental damage caused by our drive for material wealth. Atrato focuses on the river Atrato that runs through Chocó. The river plays an important role in the region’s history, and the environmental challenges it now faces are placing enormous pressures on people and the wider ecosystem. From 2017, the foundation will continue to explore these global challenges through critical reflections by invited artists and writers from around the world. Photography by Andrés Aceves, Andrés Vélez, Jonathan Colin, Fernando Arias, unless otherwise noted.